New automated voice channel level mixer. This automatically mixes the subliminal voice track at a subliminal level even if the background level is changing. Use any .wav or .mp3 file or files as backgrounds. Built in recording mixer for easy access to recording inputs. Mix many background sounds together such as soft music and waterfalls. Built in Binaural Beat generator for matching brain wave patterns for maximum subconscious penetration. Recording section allows you to record stereo or mono with selectable bit rate and sample rate for CD quality recordings. 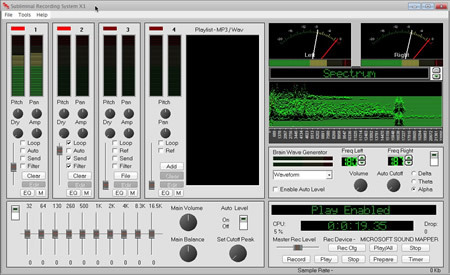 MP3 playlist channel for loading many wav or mp3 files for use as backgrounds. Freq shifter to move audio files to any freq you wish. Integrated MP3 to Wav Decoder to convert MP3 files back to their high quality wav files. Integrated 8 Track SoundScape Recorder to make Custom Backgrounds for your Subliminal Recordings. Integrated Text to Speech Recorder. Just type in the text messages and record your computer speaking them. Great if you do not have a microphone. 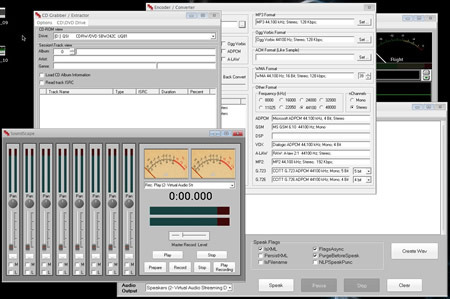 Integrated Digital CD to Wav Extractor for saving songs from CD's to use in your recordings. 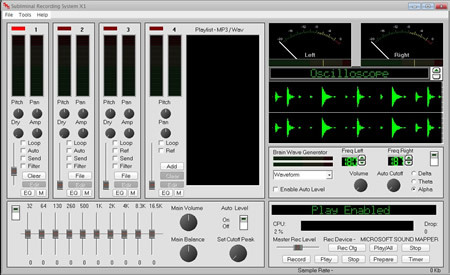 Integrated Wav Editor with 14 effects including Reverse, Echo, Band Pass and many more. Great for making messages play in reverse like the famous Stairway to Heaven recording. Integrated Screen Strobe Light. Makes your computer screen flash like a strobe light. Great for self hypnosis sessions. 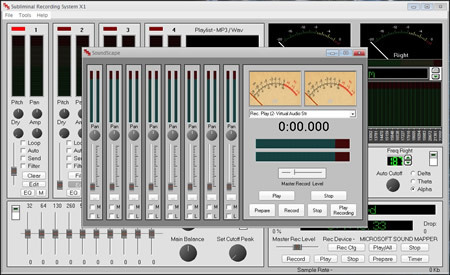 This easy to use subliminal recording system gives you complete and total control of what you want in your subliminal recordings. Our exclusive software has everything you need to start making your own Subliminal Message recordings right away. Why buy subliminal CD's if you really don't know whats on them or it's not exactly what you want. Now you can make fully self customized subliminal CD's anytime you want. Our low price is a small price to pay for this life changing system so get yours today!